The black cat that escaped from Sue’s end room turned up at Lisa’s in Newburgh so is now safely back at Sue’s. An outdoor sale had been planned last Saturday but the awful weather made it impossible so Sue would like to thank Lin from Rossie for helping her to blitz the back of the Newburgh shop! We welcome 2 new volunteers – Vicky in our Newburgh shop & Dawn Forbes in our Muchty shop – we could do with another volunteer for our Muchty shop if anyone has a morning or afternoon spare. Apologies from Sue for there being very little jam – she is up to her eyes in cats & kittens and has simply not had the time for jam-making!! Thanks go to Lesley Flynn of Cupar for her donation of cat beds & carriers, and to Linda Nielson for collecting them; to Muchty Monkeys for their donation of bric-a-brac, books & puzzles; and to everyone who has donated apples – keep them coming please. 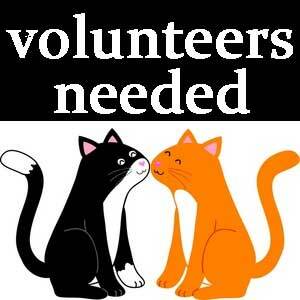 Volunteers needed to work in our Auchtermuchty shop – even half a day would be a great help!